In my studio I have custom designed speakers. Soffett mounted. Currently I'm using a Bryston crossover. The speaker designer is urging me to change it to a DBX Driverack crossover (or simular) so he can adequately set the delay, eq, and C/O points. The problem with that is the fact that the DBX is digital. I'm having a psychological issue with the digital conversion before output to the speakers. Should I let the designer use the DBX or should I stick to my reservations and try and find an analog solution or keep the Bryston? What crossovers are used in mastering rooms? It seems most racked crossovers are designed for PA systems. Well, the DBX could help you determine the best crossover points and then you can try and find or build a more suitable analog version with the required settings - so you avoid the AD/DA conversion? Most speakers come already designed with proper implementation of the crossovers. So, at least myself, almost never have to deal with this. Only when Subs are involved do we play with the CO, and it's usually the engineer that decides for himself the settings he is comfortable with over a period of a few weeks or months. Northward Acoustics - Engineering and Designs. Don't fear the crossover... My speaker company has some customers who offer a lot of resistance to the DSP crossover. (We typically use the DBX Driverack for stereo systems). I feel that my partner and myself are very discerning listeners and probably more critical than many of our clients. We used to use an active / passive design with a custom class-A active crossover between the lf and mid... then passive from mids to high. When we switched (upgraded) to the DSP units the difference was startling! The ability to do the fine tuning at the crossover points including individual driver adjustments, delay, etc. is such as improvement that it's no contest. The system just works and sounds better with these newer DSP crossovers. Try it. You'll like it! There are no analog crossovers that can do what these boxes can do, PERIOD... Don't fear the crossover..
Also most of these boxes offer digital inputs so if you have a way to control the volume (in the box?) in the D domain you can skip the conversion all together... OR you can use one of your high end mastering A/D boxes as the monitor input DA and go into the crossover digitally while keeping your analog monitor and volume chain.. all options..
Can you tell me are you using the expensive new 4800 models that do 96khz or the standard 260's that do 48khz? crossover and next step can be building custom analog crossover. have an analog crossover you may get it from properly custom designed analog crossover. Bryston crossover don't provide too. - In some situations, proper crossover/eq may be too complex for analog realization. - You cannot program or "tweak" it after design... without component changing. - you can have a classical gain regulation before crossover. But you may have problems with gain regulation. you will have audible quantization errors (quantization noise) when levels are low. outputs, then you can use external D/A converters whichever you like. may be digital, in crossover itself, but with dithering applied, controlled with some practical remote ctl. including a decent D/A converters (low phase noise oscillator,... etc.). you possibly don't need more than that for any purpose, mastering studio included. And I agree that digital crossovers aren't a problem you may fear, they can be excellent if, as always, implemented properly. yeah... all that stuff that Bogic just said! I really need to get some Hypex amps and test them on the mains at the studio. I heard them many times in studios (especially mastering) it's like there is an extra LF octave. 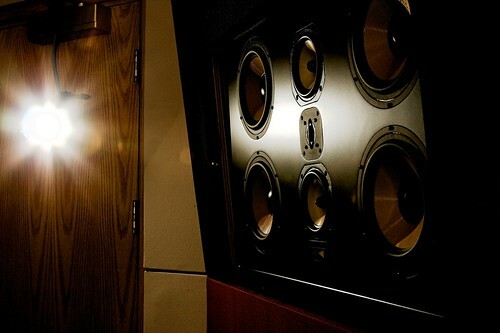 Who designed your mastering room (and your custom loudspeakers?)... why did choose to go with in-wall speakers?? I've done a lot of high end mastering rooms and everyone of these guys has selected free standing (hi-fi) speakers... just curious. Our rooms were actually designed in 1989 by Group One Acoustics, Terry Medwedyk. I was not involved with the studio at that time. I believe in-wall speakers were the flavour of the moment... but I can't be sure. Here is a pic of the room: The speakers have been lowered about a foot since the picture was taken. I'm happy with the set-up but I do realize I can get better performance out of these speakers with proper crossover as the designer had intended. Phil, my partner here at the studio, occupies the other room (which is mirrored to mine) has moved to floor standing speakers and had not looked back. I'm determined to stick with the in-wall for now but that may change in the future. I've been eyeing these crossovers on ebay: http://tinyurl.com/4rtox8g price seems right and offer 96khz conversion. Perhaps you could rent or borrow some crossovers before you commit. I had some PMC speakers on trial some time ago. They said many of their clients used a Sony speaker processor. Sorry can't remember the model. In live/PA work I have used the XTA products on many occasions. No A/B comparisons but I felt confident with the operation, build quality, the general vibe off them. I typically turn down the power amps to 50% or even lower, in order to get something happening on the meters of such digital units. Not much point running a 24Bit unit at 12-14 Bits! Is there a real benefit to using active or passive crossovers as opposed to using tuned speaker enclosures as crossovers? Some cabinet designs roll off the low end by design, others the high end, again by design. I don't know - this is why I am asking. - designing electrical filters is easier, cheaper and more accurate than designing acoustical filters.